It is not an easy thing to fully describe and share meaningfully even one experience in our lives little alone try and express the totality of a lifetime. A little more than a year ago, Venu, who had been a disciple of Sri Chinmoy for 40 years passed away. His exemplary life of devotion and dedication to his Spiritual Master was unique and were it not for the exhaustive logbooks that he meticulously kept none of us could possibly understand just how remarkable his life really was. For all those whose own lives intersected with the dynamic and powerful orbit of Venu’s, we knew at least something about how relentless and all consuming his training regime was. You could not help but be aware of this because he seemed to be perpetually training and preparing for one event or another. Particularly the swim run in San Diego, which was like a yearly sacred pilgrimage for him. It was only when his journey on the earth plane had made its final lap, that those of us who loved and knew him well tried to take some fuller account of this life. A life which always seemed to brim with enthusiasm, optimism, and tireless dedication to the inner life. 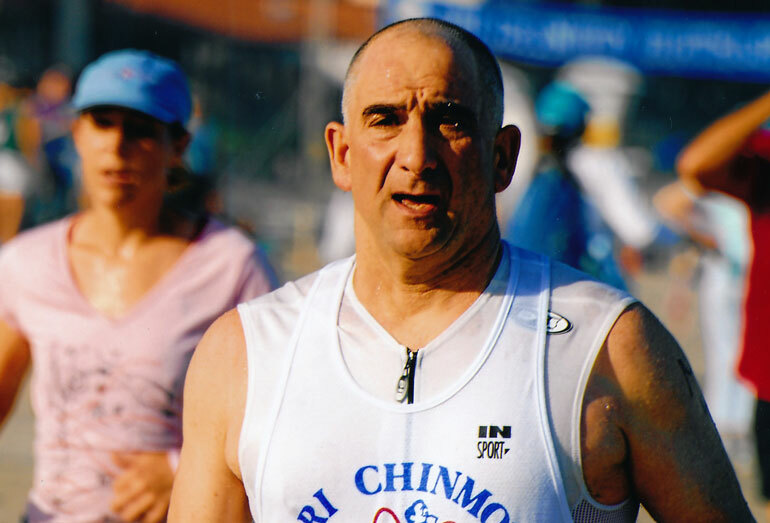 I was in the San Francisco Sri Chinmoy Centre with Venu for almost four decades, lived in the same house with him for years, ran races with him, worked side-by- side with him, talked running and cycling with him right to the end. I shared his enthusiasms for many things and took issue with him over some other things. He was my friend, a very good friend, but it wasn’t until the day I opened the pages of one of his training logbooks that I really met him face to face and heart to heart. Until that day, I had no idea at all of who he really was, nor did I possess any proper sense of the heart that beat so devotedly within his breast. To meet Venu through the day-to-day entries of in his training diaries, is to meet ones own self face to face. It is to see and feel the rise and fall of an ocean vast energy, the same life energy that animates each and every one of us. It is to be swept along in the streaming drama of that energy. To bear witness to Venu’s struggles, to see how he managed his successes and failures, is to gain a valuable perspective on our own. For this reason, we have made his logbooks available to everyone. The entire collection is, or soon will be, posted at the Sri Chinmoy website. I recommend them to everyone, regardless of your gender, personal interests or spiritual orientation. To open the pages of Venu’s training diaries is to take a stroll down to the seashore of this vast ocean of energy and feel the ebb and flow of it as it moved through the veins of one very good man. You won’t need to be an athlete to benefit. For those who knew Venu even casually, this will come as no surprise; he carefully observed and evaluated everything he did. He was a meticulous record keeper, particularly when it came to his workouts. He was a true believer in original self- knowledge; it was the only kind of knowledge he really trusted. As a consequence, he scrutinized his body’s response to exercise and diet as well as a number of other experiences very closely. Many people do this; to one degree or another, we all do it. What separated Venu from most is that he acted upon his observations in a most disciplined manner, changing his daily routines, his diet and exercises accordingly. But beyond athletics, he changed his thoughts and opinions as well, according to an ever widening range of observations. He was a student of the hard science of yoga almost as much as he was a devotee of the yoga of love. And yet, the notations in his logbooks are almost cryptic in their brevity. He does not analyze or offer an opinion on anything, not even his own workout routine. Partly, this is because his logbooks were always meant to be a private notebook to himself. They didn’t exist to explain or narrate anything to others. The brevity of his entries was also because Venu believed that opinions were… well, just opinions. His view was that our understanding even of ourselves, much less the world, was very a subjective and individualized thing. “Reality” for him was in the numbers and the personal experience that came from generating those numbers. The magnitude of Venu’s athletic effort listed in his logs astonished me. I had no idea he’d run so many marathons and ultra marathons; but what moved me far more that anything was the devotional feeling in those pages. 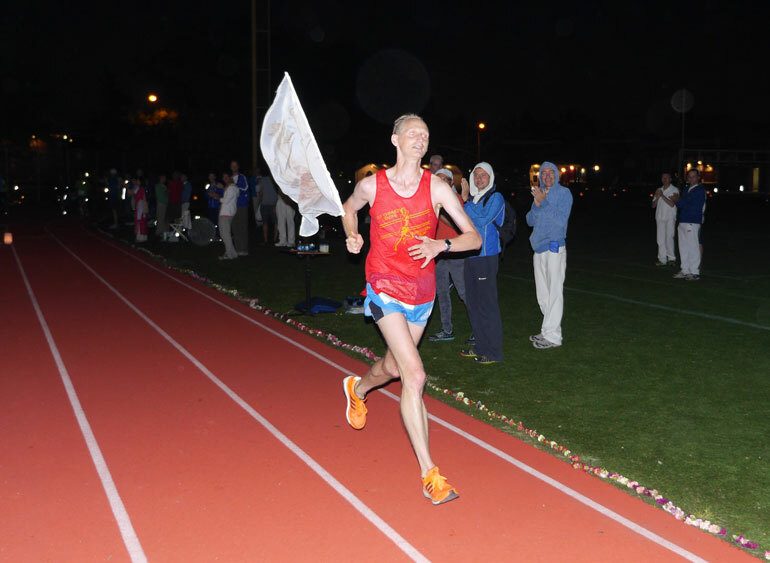 He ran “moonlight marathons” at midnight with a prayerful devotion. To these running prayers he gave spiritual names like, “I Want My Pure Heart Marathon.” Sometimes he ran his marathons in intervals, 2 and 3 mile at a time, often at a hard pace. He would repeat these interval runs throughout the day, and sometimes throughout the night, until he had covered the marathon distance. On multiple occasions he ran a marathon every three days, and did this for months on end. All is neatly and concisely recorded in his logbooks, usually without any additional comment. There are dozens of cryptic notations scattered through these pages, brief remarks that somehow convey the poetry of his soul. Seen objectively, Venu’s logs are an extensive record of one man’s aspiration, a book of prayers written without self- consciousness, exhibiting neither guilt nor vanity. At the end of his life, he asked me if there was anything I wanted. Without hesitation I said, “Your logbooks!” I knew they were the crown jewel of his possessions. But there is, in fact, a real need for this book. There is a need for the pristine record his logbooks preserve – that of an ordinary man with an intense aspiration, living in precisely the way his Spiritual Guide requested him to live. It is a record of a remarkable and inward obedience, faith and trust, expressed in quantifiable actions. In these logbooks, The Sri Chinmoy Centre may have the most complete record of any single discipleship pertaining to our path. Even if that is not the case, certainly it is a valuable one, a clear and precise record. One can almost hear Venu’s heart beating in these pages, his sweat soaking through the ink; but more than that, in these pages you experience psychically and psychically a soul striving with great determination to please God, and doing so happily, singing in every page a song of praise and gratitude. This is a case of both quality and quantity. Venu’s logbooks are a voluminous and authentic record of a very human soul. Human beings have ups and downs and Venu was not different. Every year of this record does not shine as brightly as every other year. For this reason, I’ve summarized his logbooks year by year for those who don’t have the time or inclination to survey them thoroughly. Reading the full record will, of course, require some patience and it may seem a bit tedious at times to review every day of someone else’s life; but that, in my estimation, is the real value of this record. Venu was a surfer long before he was a runner and the tug and pull of the ocean is in every page of his athletic record. The story flows forth in the steady rise and fall of his energies, day by day, for decades, but there is within this record an undeniable trajectory of spiritual progress. As the years come and go, you see a light begin to shine, not suddenly or dramatically, but gently like the sun rising, a warm and soulful radiance gradually making itself known. Love, devotion and gratitude all begin to shine forth from these pages in all their radiant glory. Venu went through a number of athletic phases. 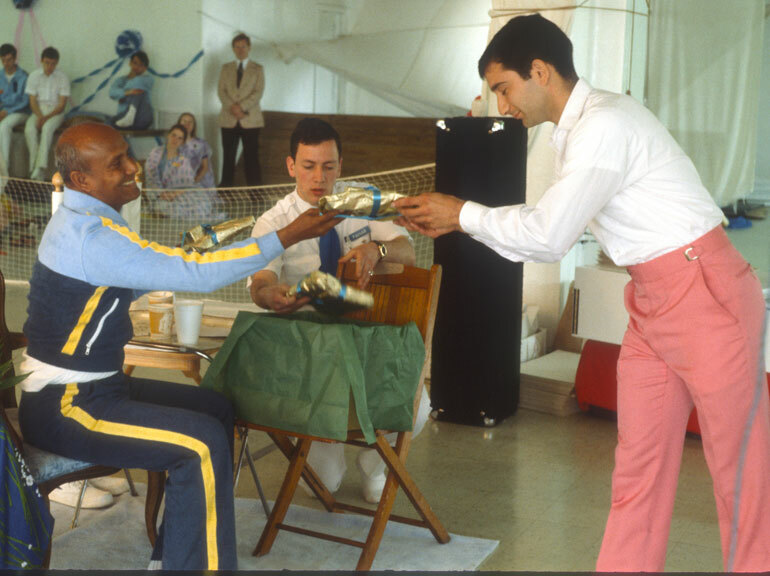 At Sri Chinmoy’s request, he tried several things, each with his own unique brand of intensity. He had some notable successes, like his Egg-in-the-Spoon Guinness record; but there were also frustrating failures, like his backward walking record attempts. Every effort was not a goal achieved. There were failures in store for him, as there are for everyone; but with Venu, very few demoralizing setbacks and not a hint of self-doubt. If one of his enterprises collapsed, another quickly took its place. If they are anything, Venu’s logbooks are the record of a dauntless spirit, a soul not extraordinarily gifted in terms of any physical or athletic prowess, but an absolutely adamant spirit and a life will that simply did not know how to quit, even at death’s door. Despite the brevity of his logbook entries, they manage to be highly autobiographical in a surprisingly personal way. They tell a very intimate story of a man gradually finding himself and of a soul shining through that man, brighter and brighter with each passing year. A striking characteristic of Venu’s logbooks is the complete lack of self- consciousness with which he made his entries. Virtually every diary is kept with the idea that it might someday be read by others, as a consequence there will be in the pages of that diary at least a modicum of self-consciousness on the part of the author. But Venu never expected anyone to read his logbooks; they existed entirely for his own reference and inspiration. In the latter years of his life, they became more apparently a dialog between himself and God. Late in his disease, when it was obvious he was going to die, I asked for permission to take possession of his logbooks. I remember the expression on his face; he could not imagine why I would want them or what I would use them for. It is this humility, his utter lack of even a subconscious self-promotion, that gives a marvelous authenticity to this record. In it there is no padding, no exaggeration, no explanation. It is an austere and objective look into the inner sanctum of one man’s soul, as seen through the dynamic of his athletic effort. In the year of 1979, something else was beginning to manifest – his habit of running long races in close proximity to each other. This would become a signature aspect of Venu’s athletics. On May 28th he ran the Pacific Sun Marathon in a time of 3:24:27. 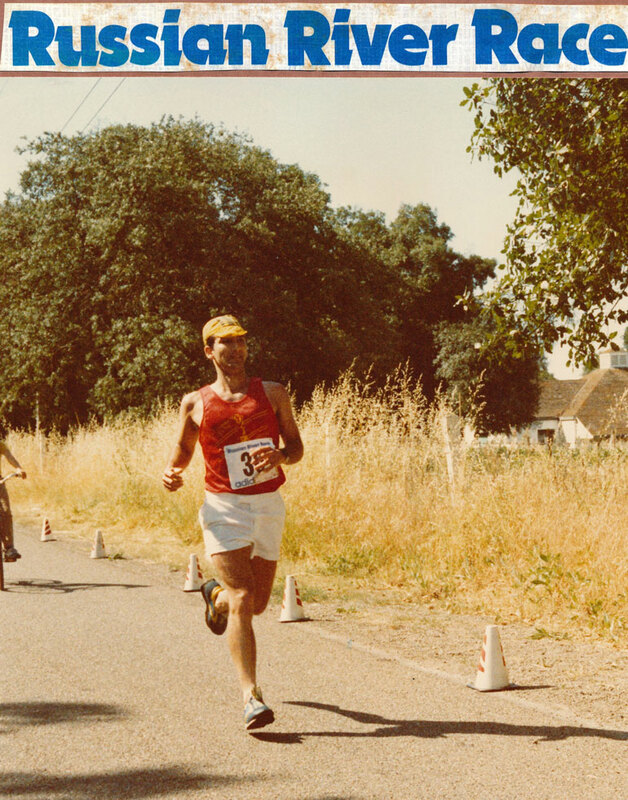 Thirteen days later, he ran the Russian River Marathon in 3:23:33. 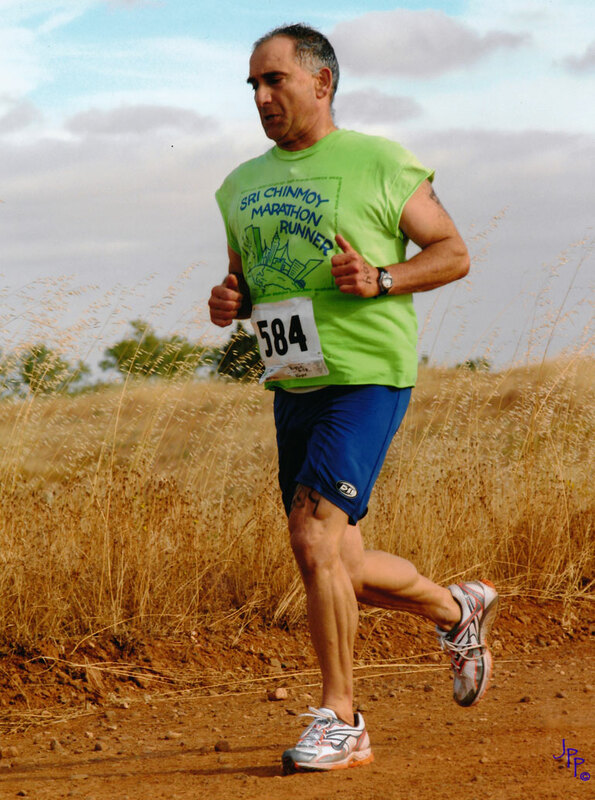 The following week he ran the Father’s Day 13 mile race and the week after that he participated in a biathlon. This was quite contrary to the coaching advice we’d both been reading, and it was an early indication that Venu’s athletic endeavors rose from an energy that was more spiritual than physical. Right from the beginning, he set priorities, trained and raced according to the movements of his psychic life, and finished races that meant much more to him than just the miles covered or the times achieved. 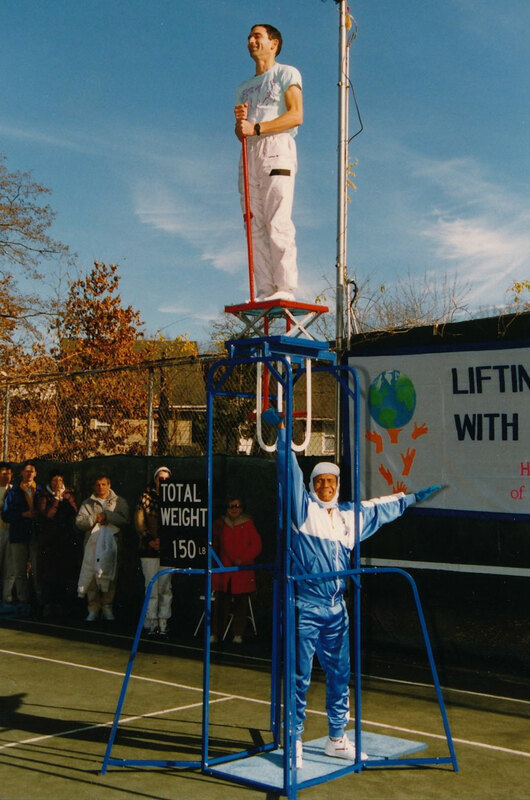 It was Sri Chinmoy’s request that Venu search the Guinness Book of Records for a feat he could best. He choose the “Egg-in-the-Spoon” marathon, an event where one runs with an egg balanced in a spoon for 26.2 miles. This was all very new to us at the time. Whether it was the absurd and charming nature of the event, or just the excitement of seeing one of our own attempting a Guinness Record, I can’t say; but Venu’s enterprise captured the imagination of the San Francisco Centre. 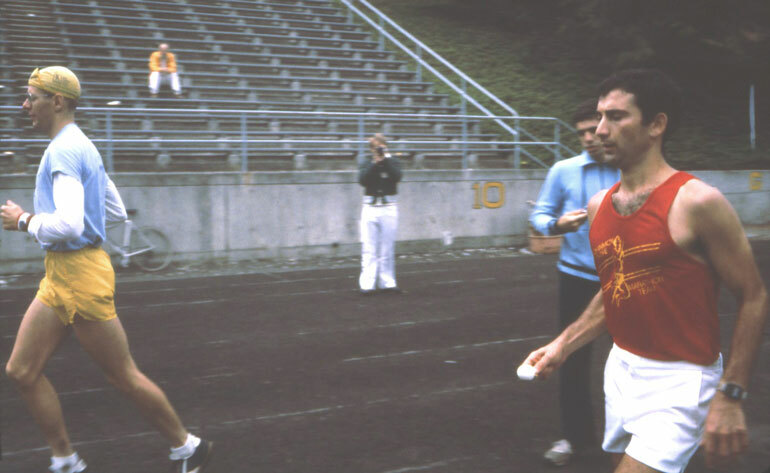 On weekends, we’d pack a picnic lunch and meet on the grass infield of the local college track to cheer him on as he ran ‘round and ‘round us with the egg wobbling precariously in that spoon. The boys would take turns running at his side and occasionally someone with a camera would show up. At times, he looked like a beekeeper with a hive bees swarming around him. It’s hard to imagine this “encouragement” was anything but a great distraction to his concentration as he hurried along like a man in a trance balancing the egg in that spoon, but he never objected. He accepted and probably secretly rejoiced that his record attempt had become a Centre activity. 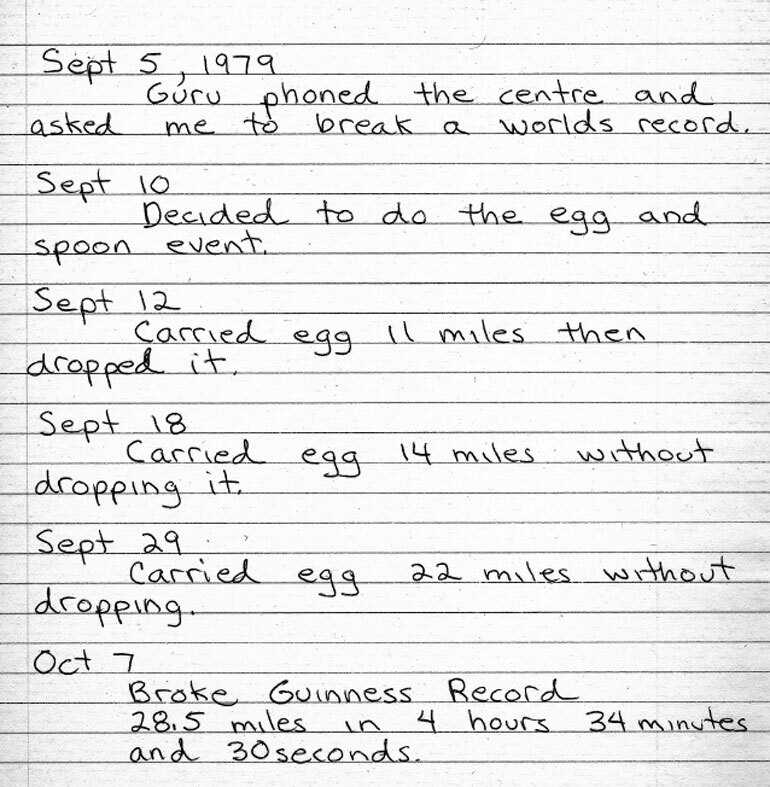 A month after receiving Guru’s request, Venu broke the record in both time and distance, going past the marathon mark to run 27 miles, without ever dropping the egg. His marathon time was 4hrs, 17minutes and 51 seconds – a very decent run even without an egg in play. These he ran alone without benefit of aid stations or support. He finished this 12th marathon in a time of 4:43:37. 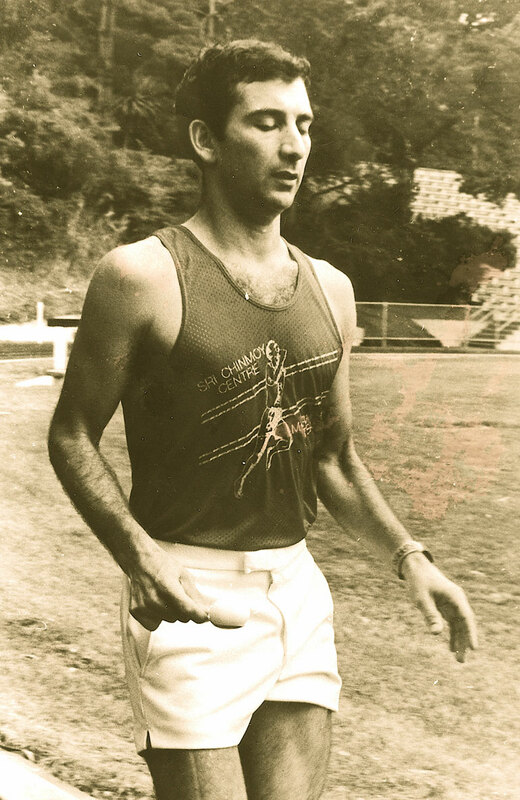 By his final marathon of 1979, Venu had settled into a habit of running long distances with very short intervals of rest, and his runs had become more than just workouts, they had become prayers. These “prayers on the move” would be a key element of his spiritual practice for the next thirty-five years. On May 5th he notes that Guru called him to wish him a Happy Birthday and said the singing group had improved tremendously under his leadership. “Thank you Guru.” He continues to do intervals that match the marathon distance every three days with two easy days in between. In mid-May his long day totals drop ten miles to 15 miles of intervals. On May 24, Guru tells Venu he’s proud of his swimming. (Venu hasn’t swum in almost two months). 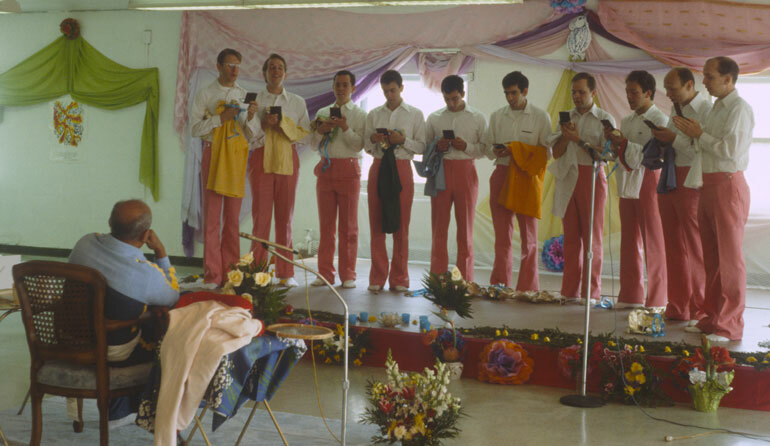 Guru also says he thought the SF Boys Singing Group was collapsed and dead, but that now it is alive with “fruits and leaves.” He asks Venu how many songs the group will sing in August. It is Guru’s second conversation with Venu about singing in three weeks. Venu takes the hint and puts more emphasis on singing. He also goes swimming that afternoon and does almost a mile of laps at a city pool. “I am very, very proud of you. You have always listened to what I have asked you to do. You have surrendered to my requests. On October 17th Venu participates in the LA Masters Games. His logbook contains Guru’s personal application to the games. 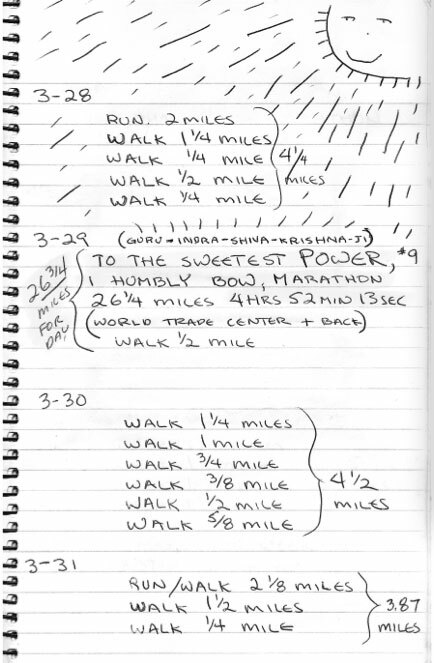 Beginning with his egg marathon in 1979, through the backward walking, the marathon and ultra-marathon years, a goal is always visible in Venu’s logbooks; in most entries there is a discernable training design. That was lost somewhat during the ‘90’s. In that uncertain period where injuries and confusions begin to obscure his objectives, Venu wavers and appears to have no distinct goals. As a result, we see a certain amount of “drift” in his training. But this is, in its own way, a valuable time, for Venu begins to rediscover what he knew all along – that the journey is the goal, that in athletics and the effort it requires, there is a great thrill and a radiant happiness quite apart from any ribbons or awards. In 2001, and particularly in 2002 and 2003, his original inspiration returns to him and with it a new set of goals. He wants to excel as a triathlete. As his training gathers momentum and his inspiration grows, his goal becomes the highest of goals in the triathlon world – to participate in the Ironman Triathlon held annually in Hawaii. But he is now 51 years old and still not completely recovered from injuries that have limited his ability to train hard. 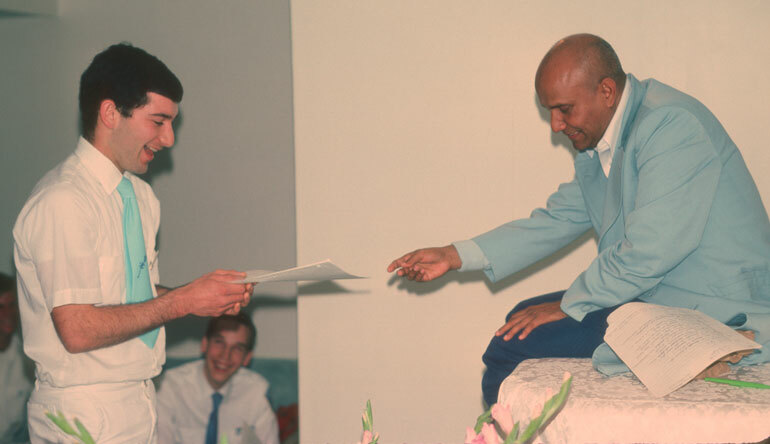 He knows the necessity of a great effort on his part, but he has also learned from the teachings of his spiritual guide, Sri Chinmoy, and from past personal experience, that the outcome of all our efforts is ultimately decided by God. He presses on with the same youthful and single-minded determination for which he was famous; but there is, in the entries of his logbooks, within and around the highlights and asterisks of his training notations, an invisible quiet space, a growing spiritual detachment. More and more, we sense that part of him that was always just watching the show, observing the drama that surrounded his athletics endeavors. More and more, “Thy will be done” can be heard in a whisper throughout those pages. 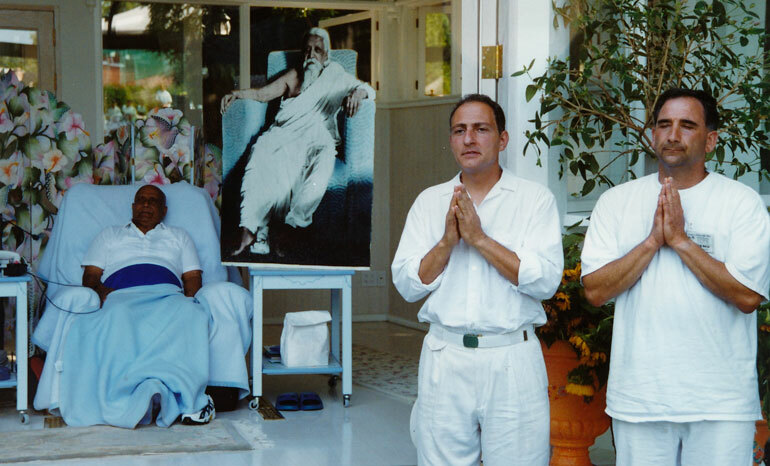 The cover to his 2008 logbook is a photograph of Venu smiling as he stands behind Guru who is seated in a chair. Guru is also smiling. 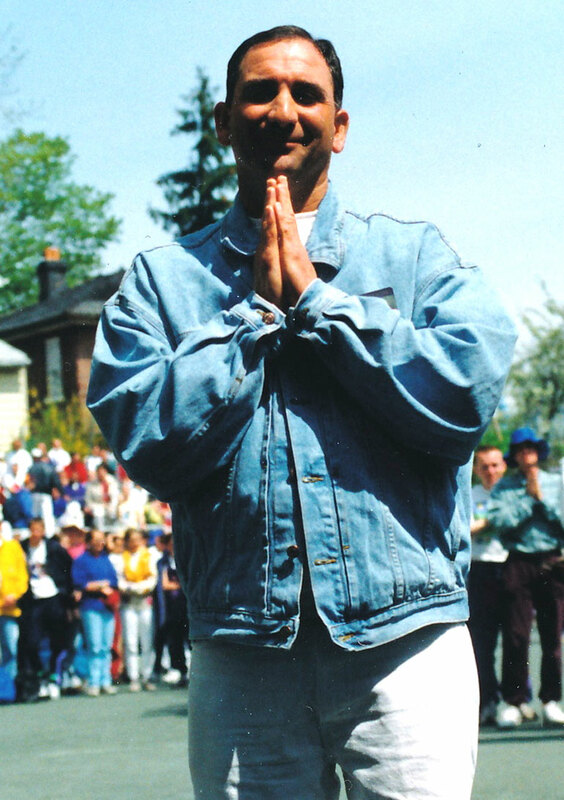 The photo is from the 2003 Self-Transcendence marathon and Guru’s hand is raised almost as if to say, “Behold, my champion!” Champion indeed. Had Venu not believed this, had he focused on a more scientific and physically oriented approach to his athletics, his immediate quantifiable performances might well have improved more quickly, but his enthusiasm would also have peaked and played out in a way it never did in his spiritual approach. In any event, but the satisfaction Venu relished and required would never permitted a merely objective and scientific approach, because that satisfaction was itself spiritual in nature, and only a spiritual approach could have fed it. For this reason, Venu entered into athletic competitions seeing them as much a challenge of concentration as of physical speed or endurance. The body and its response was merely the meter and reading by which that concentration and the accumulated force of previous training efforts was measured. This is not to say Venu didn’t care about performance. He was intensely competitive by nature; but he regulated and sublimated that side of his nature by training in a meditative consciousness until he learned how to compete with himself first and foremost. This progression from mere athlete to spiritual athlete is quite visible in Venu’s logbooks and it gives to them yet another special value. One can see a spiritual blessing accumulating, and an inward progress accelerating, in these pages. By the year 2009, Venu’s logbooks have become as much a record of devotional bhakti, as they are a record of athletic training. Pictures of Guru and Alo begin to fill the pages, as do poems and aphorisms. The word “Supreme” appears in yellow highlight everywhere. “Thank you, Guru” becomes, perhaps, the most common entry of all, his constant mantra. In a previous year, Venu wrote that the whole meaning of our path can be expressed in three simple words, “Thank you, Guru.” That belief approaches its complete expression in the final years of Venu’s athletic record. Gradually, year by year, Venu’s logbooks have begun to take on the appearance of what they have really always been –a spiritual diary. Prayers, aphorisms and pictures of Guru and Alo begin to find their way into the books more and more. In these last years, Venu’s own prayers and aspirations make an appearance as well, but until this year they have always seen quite subdued and understated. 2011 is the year when, like a tidal wave, his devotion comes rushing forth and his logbook becomes a spiritual diary in the truest sense. On the 9th and 10th of February, he meditates and sings for 5 and 6 hours respectively. On the 11th he writes, “Lord, I do not know what is going to happen, but I do know that I have been waiting for this year for 24 years.” There is no way to know from the logbook what exactly it is that he has been waiting for. He has been having inner experiences for some time, perhaps because he is meditating more; or perhaps he is meditating more because of these inner experiences. After the 11th of February, his log entries are all about meditation and devotional singing. He is often spending 5-6 hours a day in meditation. On February 25, he notes a “powerful” kundalini experience. All appears to be going well as Venu begins the month of April. In his logbook he makes no mention of his near collapse at work, or of having to be hospitalized for two weeks. The only indication of his situation is an entry on April 4th under “walk.” The notation is not in miles but minutes – 2 minutes. That walk and future walks are being done in the hallways of a hospital pushing a wheeled IV stand in front of him. A dauntless spirit even in the hospital under going chemotherapy, Venu logs walks four walks on April 5th of 5, 3, 3, and 4 minutes. Then, as the therapy weakens him, nothing for ten days. Still in the hospital, he begins to recover enough to make a single walk of 8 minutes on April 14th and then multiple walks, first of 2 and 3 minutes on April 16th and then 12, 9, and 7 minutes on April 17th. He also notes that he sang the Long Song inwardly. There is no mistaking Venu’s frustration during this period. His spirit is more than willing to make a comeback, it is figuratively speaking, champing at the bit; but his body is unable to keep the pace he wants. Again and again, he mounts an attack on the inertia of his body. And again and again, his body rejects his effort to re-energize it. Venu’s 2013 Logbook is difficult for me to write about. This is in part because it was his last year of life, but also because this logbook includes pages from past logbooks, pages that record events which were, for Venu, key reference points in his spiritual life, a life far too inward and private for any other person to accurately write about. The book itself starts out with a lengthy account of a spiritual experience that took place in 1987. Certainly, he was aware of the fragile nature of life. By January of 2013, there could have been no doubt in his mind that he was in a life and death struggle with his cancer. The inclusion of two entries from previous logbooks at the very start of the 2013 book seem to verify this. The most logical reason for their placement in the 2013 book is that these entries were about events that were extremely important to Venu and he wanted them placed where he could frequently and easily access them – in the pages of the book into which he was making daily entries. 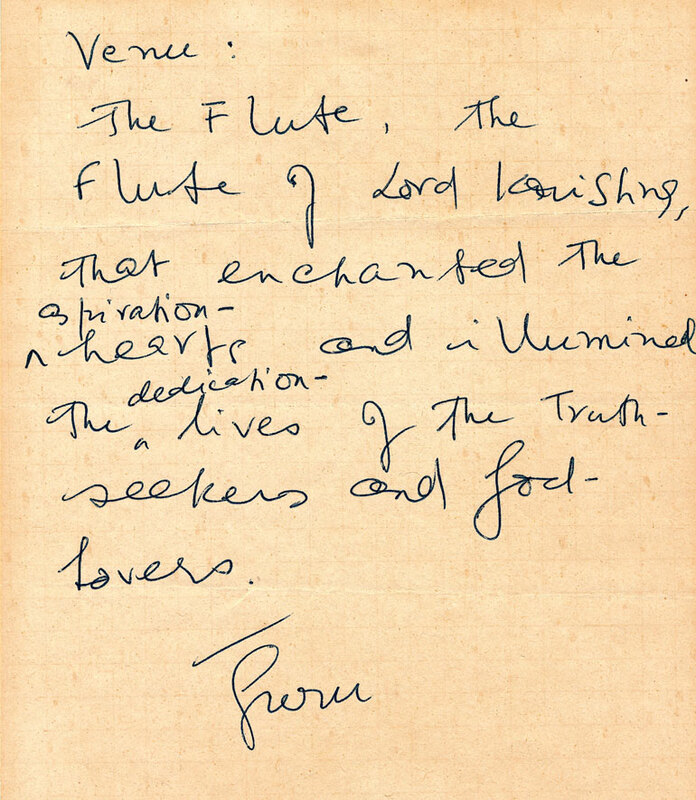 Guru: “Venu, come and be on the stage – Lord Krishna’s flute stands first, nothing, else. This is a declaration: Among all the boys all over the world who have sung the song, ‘Dyulok Chariye’ Venu the Great, San Francisco Centre, California, stands by far the best. Among the girls, God alone knows, but among the boys, I know. He sang most prayerfully, most soulfully, most perfectly. Therefore, Venu stands first. He was the leader of the San Francisco Boys Group for many years and became a member of Kailash’s international boys group, a responsibility he considered a great honor. But I think it is safe to say this particular moment on stage before Guru was probably the highlight of his singing career. It was probably meant by Guru to be that highlight. Venu always practiced Dyulok Chariye (The Long Song) as a high and sacred prayer. He never sang it casually or carelessly. It is perhaps no coincidence that singing this song is something of a workout, requiring both stamina and prolonged concentration. It was, therefore, an ideal song for Venu. Of Guru’s songs, Dyulok Chariye was the most important to Venu. Venu entered a stay-at-home hospice program in July. I arrived on Monday, July 8th to care for him. The day after I arrived, he insisted on going to the bank and to Trader Joes for some fresh fruit. I hesitated as he looked quite emaciated, but his voice was strong and full of vitality, so I allowed him to convinced me that he was up for the trip. A short walk from and back to the parking exhausted him and it took a long time for us to get back up the three flights of stairs to his apartment. He did not leave his bed again after that. Even when confined to bed for those final two days, his voice remained strong and full of energy right to the end. On his wall he had taped a prayer written in bold marker imploring the Goddess of La Jolla Cove to get him through the swim. Only on Wednesday, the day before he died, did Venu admit to me that he probably wasn’t going to make it to the swim/run. Right up to a week before he passed, Venu was exercising and hoping to compete in the race he most loved, although he was no longer recording those efforts in his logbook. He was – as Guru pointed out – a real disciple, a seeker possessing a child-like soul, who sought God and lived out his spiritual life in an almost endless prayer of athletic action. His logbooks are an extensive and detailed record of that devotion. He was, in my estimation, a most excellent example of a new kind of seeker, a seeker for this New Millennium, one that worships through action. Venu swam, cycled and ran, and when he could no longer run, he walked toward The Divine along this new path, the Sunlit Path of his guru, Sri Chinmoy. Venu’s Marathon Logbook lists the date, location and finish times for 158 marathons and ultra marathons. 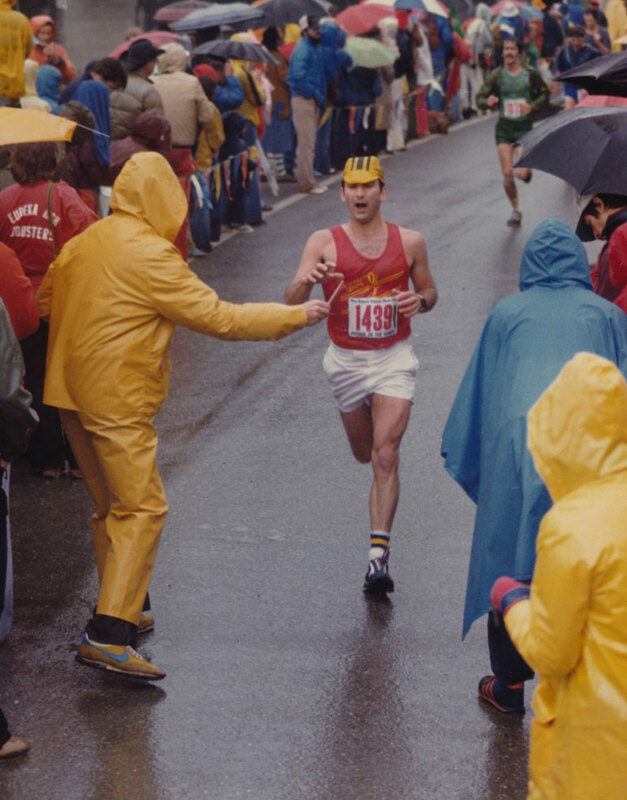 His first marathon was the New York City Marathon in October of 1978, his last a Self-Transcendence Marathon, also in New York, in August of 2004. In examining his marathon record, we notice that of the 158 marathons Venu takes credit for, 69 exceed the marathon distance. Of these 69 that exceed the marathon, 46 are bonafided ultras, being longer than 30 miles. Of those 46 ultra marathons, 5 exceed 52.4 miles, or twice the marathon distance, and one of Venu’s runs comes close to tripling the marathon distance. So, in truth, Venu ran the marathon distance a minimum of 209 times in his 26 year running career. Upon still closer examination, we discover that he ran 9 marathons in his first year, or one every six weeks. Transcending himself astronomically, in 1988 he ran 67 marathons, all of them in a 10 month period. That is one marathon every 4½ days. 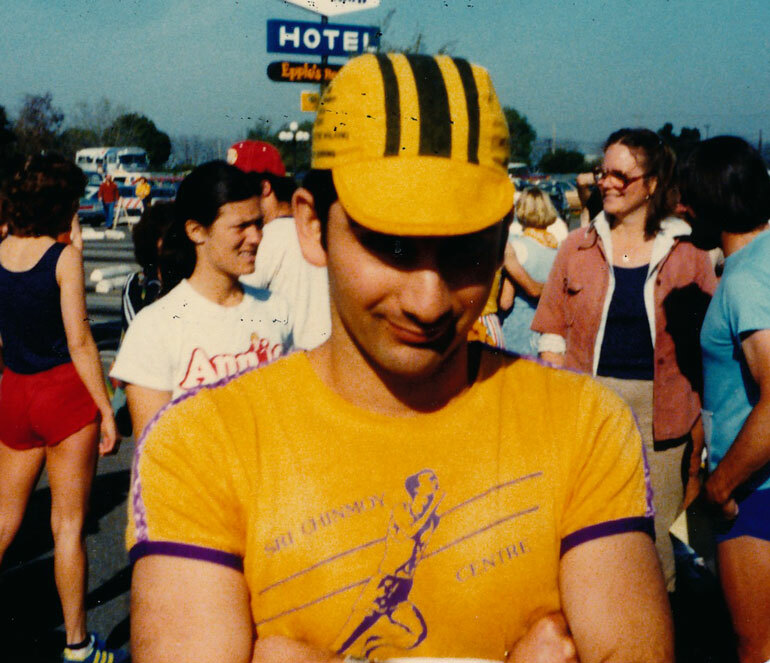 On multiple occasions, over multiple years, Venu ran a marathon every three days for 2-3 months in a row. The vast majority of these marathons were run privately, mostly alone at night, without any motivation to break records or to draw attention to himself. He ran for the sheer joy of it, for the mystical and devotional delight of it. 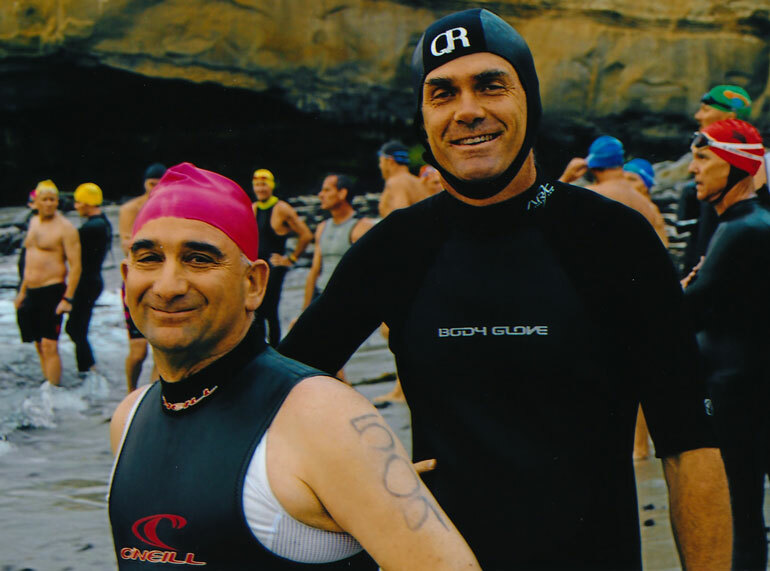 Venu competed in the San Diego Swim Run event at La Jolla 24 times. 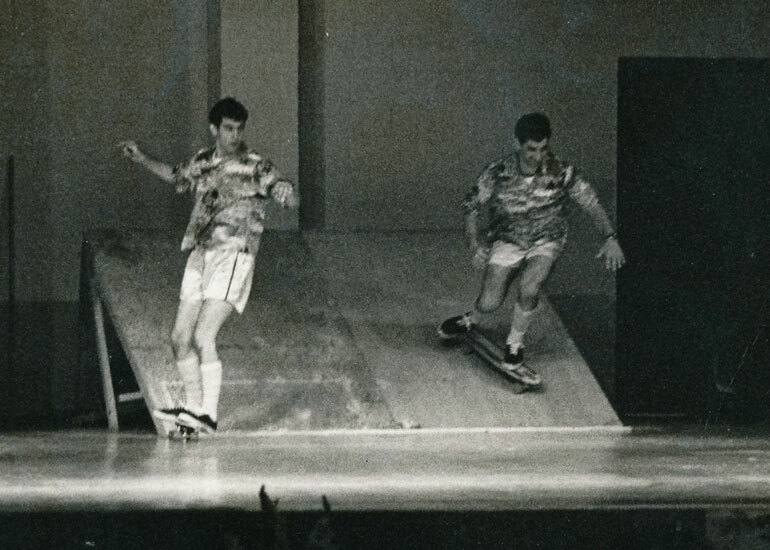 His first competition was in 1985 and his last was in 2011. During that span, he missed only one year – 1993. He kept a record of his swim times and his over all event times. The swim is what he really trained for. He finished the open water one mile swim in under 30 minutes seven times. His fastest was in 1990, when he finished in 23 minutes and 31 seconds. Over this period of 24 years, his swim times were surprisingly consistent, especially when one factors in the varying conditions one encounters in open water swimming. More remarkable than the consistency of his swim times was the consistency of Venu’s enthusiasm when it came to this event, and really all events. He was always enthusiastic about athletics, even when he wasn’t doing well in his training or, at the end of this life, when he wasn’t feeling well enough to train at all. But I think he found it especially difficult to imagine himself separated from the San Diego event. Right to the end of his life, he smiled every time La Jolla was mentioned. During the last months of his life Venu taped an 8X10 sheet of paper on his wall. On it he wrote a prayer invoking the Goddess of La Jolla to carry him over those waters. I cannot imagine that that prayer wasn’t answered. He was the constant inner gardener of our Aspiration Tree – or trees, as fate would have it. Hiyamallar is fond of pointing out, with considerable exaggeration, the small role I had in acquiring our first Aspiration Tree. I had something to do with it, but it was many years ago and that particular tree was swept away by a flood – probably because of spiritual neglect. Venu is the reason we have a tree in San Francisco now. For decades he has gone to our Aspiration Tree faithfully every morning, rain or shine. He did this even when he was quite ill. He knew all the gardeners who worked that area of the park and they knew of the tree because of him. When the tree was vandalized, they watched over it because of him. The special attention he gave to our tree made it special to them. When it finally needed to be replaced, he hardly had to ask – they already had a new one picked out. One of the last phone calls Venu made was to a park gardener – at 6am. Venu thanked him most sincerely for all he and the other gardeners had done in caring for our tree. Apparently, the man mentioned not seeing him lately, because I heard Venu explain that he’d been too sick to come to the tree. He told the man he’d be back when he felt better. That was the day before he died. Venu was fanatical about timing and accuracy of race courses. 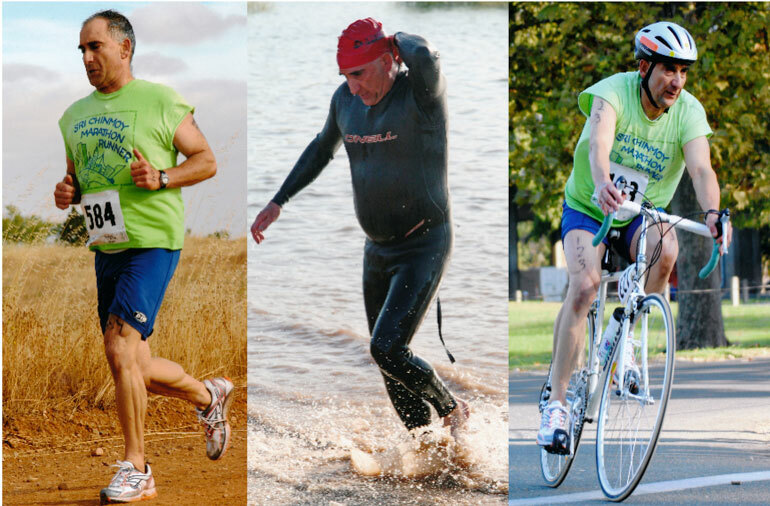 He took athletics very seriously and his dream was to do an iron man triathlon. He was a great inspiration to me and together we did two sprint triathlons in the past four years. I never would have done that without Venu’s inspiration. He had great admiration and respect for all disciples who were tri athletes, and he told me that in his next incarnation, his dream is to complete an iron man. 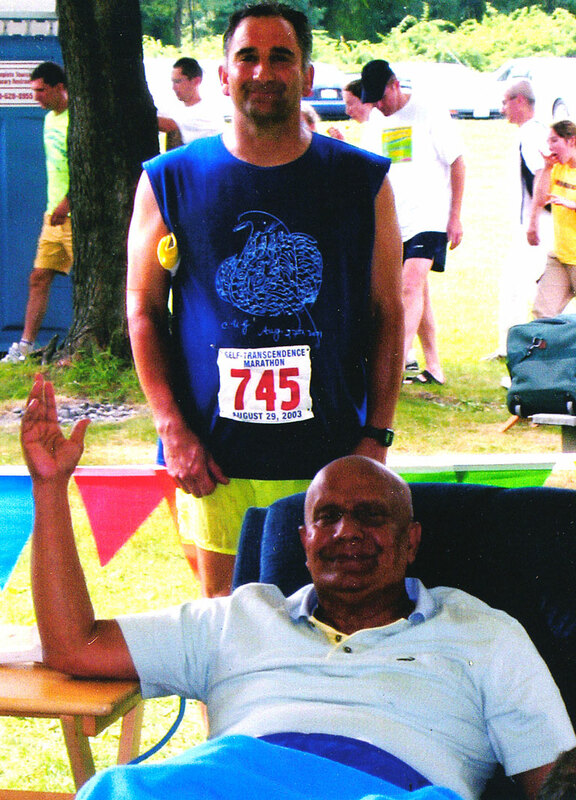 For more than 20 years, Venu was the most loyal participant in the San Diego Biathlon. 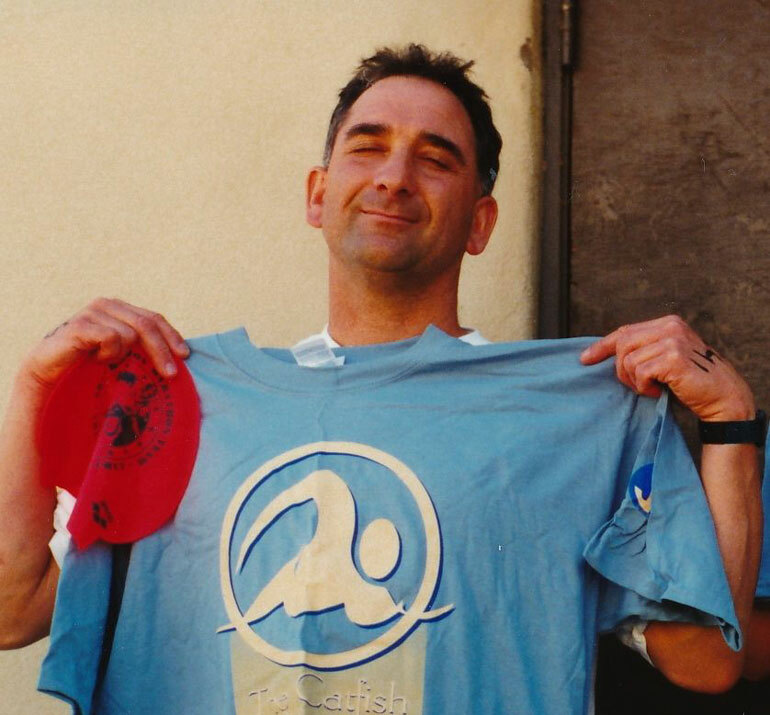 He loved that event and continued swimming until a few months before he passed away with the hopes that he would still be able to go to San Diego and participate. Venu took his athletic pursuits with the utmost seriousness. I cannot think of a better example of this than the events that took place in the weeks and months shortly before he passed away. Venu very compassionately allowed me to be in his esteemed singing group for a short while and during one celebrations Guru asked each group to learn and perform a collection of his new songs in one day. Oh boy, it took me months of disciplined practice to learn the songs for celebrations and we now had to learn just as many in one day! Venu showered a tremendous amount of patience upon those of us that were struggling to remember all the beautiful Bengali verses. After all the groups had performed Guru exclaimed that some of the singers had made up new words. That couldn’t have been more true on my part! There were officially some twenty-five boys in our group. Venu always kept a list of the members in his wallet. One time I told him I was having a hard time learning all of the melodies and that I didn’t think I had the musicality to keep up with the demands of the group. This was when we were learning the ‘Long Song.’ Venu just looked at me and said, “Keep practicing,” and left it at that. The surety of his advice caused me to feel that my abilities would blossom as the years went by, just as his had. He didn’t seek to assess my musicality and deal with it in a systematic fashion but his words really touched me and gave me the confidence to keep going. Venu was quite intense and disciplined when it came to training for marathons and other tough events. But he was enthusiastically appreciative of others when they trained and tried their hardest, no matter what the result. Even when he was bested in a race by others, Venu would be so happy and congratulate everyone, even though they had performed better than he did. Half so rich as you. For us to share, to delight in And to cherish forever. Such unparalleled treasure. You gave yourself to God As a straight, simple flute. The flowing utterances of our Father, The musical God. Venu was a very special friend. In 2002 I spent one year in the San Francisco Centre where and had the good fortune to get to know him much better. It´s impossible not to like Venu. His enthusiasm, good cheer and contagious laughter are things I still cherish to this day. He was always interested in my running and even until the last months of his life he was encouraging me in my marathons and wanted to be kept up-to-date with my results. Venu was like a running encyclopedia. He knew everybody’s times and PB’s – often much better than the people themselves knew them! I think that in one lifetime, provided there is the kind of concentrated effort that Venu gave to everything he did, one might become a champion athlete, possibly an Olympic athlete, even perhaps, a world famous athlete. But to transfer God’s Light from one heart to another the way Venu did it during his illness – that is the best argument I can think of for reincarnation. I doubt such capacity can be achieved in one lifetime. We live in an animal body, think inside a human mind and wander in a concrete world. Even God is hard pressed to make Himself felt in that environment. Under such conditions, human beings get very distorted notions as to what’s important and about who is superior or inferior. For thirty-some years, I held the notion that Venu was my younger brother. He was younger than me in years and he came to Guru after I did. I got myspiritual name before he did. He had less formal education, knew less about the world and seemed to have less interest in it than I did; so for decades I saw him, spiritually, as my younger brother. That went on until the final year of his life when I discovered that it was I who was the younger brother. As his arms grew thinner and his face more drawn, I began to see the man that had been invisible to me before – a sage walking ahead of me on the same path my own soul will take. The proof that Venu really was a sage, is that when subjected to conditions that would have aged and defeated any ordinary person, he remained youthfully enthusiastic about every aspect of his life. He sang The Long Song until he could barely breathe. In this way, his example mirrored Guru’s. Together they demonstrated how an aspiring soul can maintain an energetic, enthusiastic and child-like innocence even while dying. Human beings love celebrity. We admire those who win. We are in awe of the successful. If you build cathedrals, create for yourself a public legacy, win battles or elections, or expand the capacity of civic institutions, we will call you a great soul when you are gone. The rest are forgotten. But from Venu I have learned the smile of the loser can eclipse the glory of the winner. I have learned that an impoverished and misunderstood man sitting alone in a tiny room can possess a wealth that out shines the lords of mansions. From Venu, I have relearned the singular fact, the startling truth, that life truly is an eternal mystery, a force no one can ever comprehend or possess. The real truth about life is that it’s just a passing thrill, the Supreme Delight of being truly present in a moment of love. My dear Friends, My dear Brother and Sister, I am extremely proud of your son Chris. I am extremely grateful to you for bringing up such a NICE soul from God the Creator, to God the Creation, Sri Chinmoy. You’ve out done yourself… a very compelling tribute and an excellent choice of pictures. Venu, the Great!!! Thank you for being so good. There have been a few people in San Francisco, who inspired me a lot. Venu is one of them. Big heart and big smile. Great tribute. I just read Astika’s book about Venu, very very inspiring. Thank you to you also for such a great tribute to a Special soul like Venu.